It should be no secret to anyone that this lady loves wedges. And I mean of the shoe variety; although I love me a wedge of cheese too – sharp cheddar cheese to be exact. Anyways, back to shoe wedges. I love them because they add height to my very short body and help elongate my legs like a pair of heels, but they are so much more comfortable. And let’s face it, I’m recognizing that very soon comfort will be my number one factor ALWAYS. But this mama to be still loves looking a little taller and leaner (I can use all the help I can get these days) and dressing up. And as my luck would have it, there are TONS of wedges to be bought up for the spring and summer months to help with all of my needs. Wedges are so versatile too. You can wear them with jeans, capris, dresses, skirts; basically anything I will be rocking in the next few months will go with wedges. And they come in virtually every color and print. 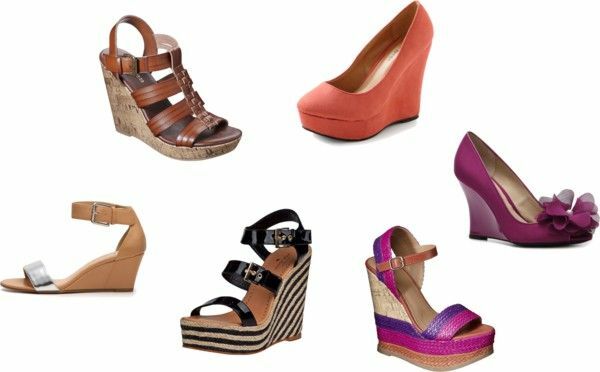 I currently have about 9 pairs of wedges and I’m definitely looking to add a few more to my closet. The above photo shows some of my favorites right now that I must track down and purchase. Which do you like? Solids? Prints? Anything as long as it’s a wedge? I’m full of questions today, I’m also curious to find out what is your spring go to item? 3, 2, 1 get to answering below! I absolutely love those DSW wedges! I was never a fan of wedges until I found the PERFECT pair at Ross last season. Now they are my go-to summer shoe, especially with jeans. And they're work appropriate, which is the best! I still haven't found a favorite pair of wedges for myself, but am loving those Kate Spade ones pictures... might have to do a little shopping! I'm super picky about wedges! I only have one pair right now - in black - but I'd love to branch out. I have the target wedges in black. Love them -- so comfy and versatile!! Those striped wedges! I need them!!! love love love wedges...so comfy!